The page included the logo and screenshots you see in the image above, as well as a description of the Sphero Mini, which "packs tons of fun into a tiny, app-enabled robotic ball." You'll be able to use the app to control the device, as well as choose from different games. The only thing we can glean about the hardware is that the battery will be good for "almost an hour of play time." 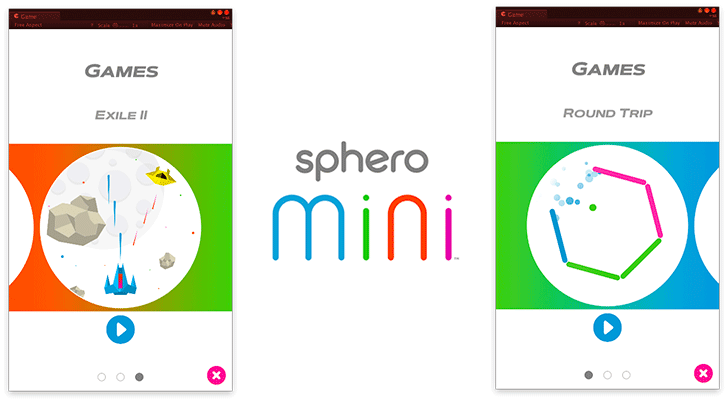 Drive Mini several ways with the Sphero Mini app. Use the joystick, tilt your device, or slingshot your robot. Stay tuned for more ways to drive as the app gets updated. Drive Mini just by using your face. Yes, you read that right. Face Drive is a hilarious new feature that uses your facial expressions to drive the ball. First in the world to use facial emotion to drive a robot. Use the ball as a controller to shoot your way through space, race a vehicle through a tunnel, or rotate your ball to destroy a polygon of bricks. Thanks to the beauty of app updates, there’s always more on the way. The most intriguing new feature has to be Face Drive, which promises control of the Sphero Mini based on your facial expressions. It'll be interesting to see how that one works, and likely entertaining regardless. We're not sure when the new ball is going to be released, but it can't be far away. The listing links to this web page for the Sphero Mini, though it's not yet live, of course. We'll update you if we learn anything more.